The Quilting Bee exists for the purpose of sharing in the joy of creating. Whether it is an heirloom quilt to be entered in a Quilt Show or a cute purse for a young niece, we want to help you find just the right fabric and create with just the right tools so that your joy may be complete. Our store features the largest sewing, embroidery and quilting machine selection, quilting fabric selection (6000+bolts) and machine repair and service department in the region. It also has the largest 1,500sf creative center where various classes and special events are held (over 100 per month). Other unique features are a kids play area and a spouse lounge, dubbed The Bunkhouse. And remember, the coffee/espresso is always on us! Sewing, Embroidering and Quilting is supposed to be fun. So if you get frustrated in any way for more than 15 minutes, give us a call or stop in for help. Customer service is the standard by which many measure themselves. We strive to go well beyond to provide a great customer experience. It starts with a unique and inviting building, continues with warm, knowledgeable and friendly staff who want to get to know you, and finishes with you wanting to spend more time creating with your friends at The Bee. Sewing creations are personal. They are a reflection of who you are. We are here to support you in trying new things and new techniques as a way of embracing and expanding your creativity. Because you deserve the best we carry only top grade fabrics, sewing notions and machines. We provide highly experienced teachers, staff and technicians so that your experience is all about enjoying creating. While you deserve the best, you also deserve the best in value. You will find many of our products priced well below MSRP, just as we would like to find when we are shopping. Mary Moltke established The Quilting Bee in 1978 as a small quilt shop in the Spokane Valley. The second owner, Jackie Wolff, purchased the business in 1984, added the Bernina line of sewing machines and in 1995 moved the business to a new larger building she and her husband constructed in the Spokane Valley. The Aubles purchased the business in 2011, adding the Janome and baby lock lines of sewing machines. 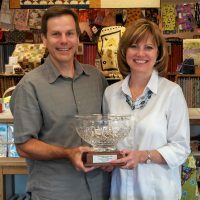 They moved the business to its current location in an even larger quilt barn themed building in the Spokane Valley in 2017.